From hip modern hotels to classic landmark getaways, London offers families many great options. Our list of top 10 family vacations in London includes luxury properties, mid-range hotels and affordable choices. On your family trip, visit the city's museums, historic attractions, beautiful parks and unique shops. At some of these hotels, you can relax next to an indoor pool after a day of sightseeing, have Traditional Afternoon Tea and enjoy the view. If you are looking for ideas for couples, read Top 20 Romantic Getaways in London. 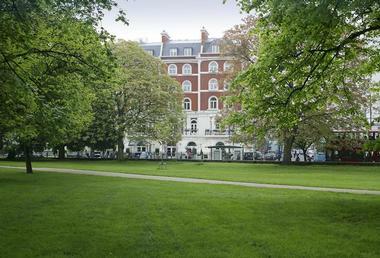 The Royal Park Hotel is located on Westbourne Terrace, just to the north of the famous Hyde Park in London. Housed in three restored townhouses, the hotel is decorated with fine artworks, antiques and Regency colors. The hotel provides a good base for exploring the city, while the nearby Paddington station offers quick access to Heathrow Airport aboard the Heathrow Express. Individually decorated guest rooms have canopied mahogany four-poster and half-tester beds. Bathrooms feature power showers, monogrammed cotton bathrobes and slippers. Some of the rooms have French windows and balconies, or adjoining sitting rooms. The hotel offers a small room service menu. There is a good selection of restaurants nearby. 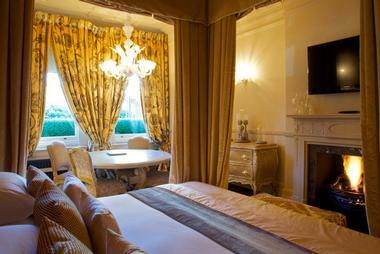 Doubles from £120 per night (+44 (0)20 7479 6600). The Athenaeum Hotel & Apartments gives each and every one of its guests 5-star service for the duration of their stay. Although there are 111 rooms, the hotel seems much smaller due to the friendly service of the staff. The hotel has comfortable rooms, a luxury spa, and a convenient location in the city. The hotel is located in the heart of West End. 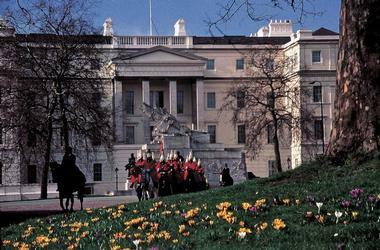 Piccadilly Circus, Green Park, Buckingham Palace and Bond Street are all within easy walking distance. See a show and explore the area on your romantic getaway in London. 111 guest rooms and 12 luxury suites combine traditional English elegance and 21st century technology. The rooms have been outfitted with Bang & Olufsen televisions, 32" or 42" plasma screen televisions, broadband internet access, and an eTV entertainment system with in-room movies and music. Have dinner at Bullochs restaurant which serves modern British food with a Mediterranean influence. Light meals are available 24 hours a day in the Windsor Lounge. For an after dinner drink, try the Whiskey Bar which has the widest selection of whiskies in London - over 250. Room rates start at 250 GBP for a Standard Double Twin. A Parkview Suite is 500 GBP (+44 (0)20 7499 3464, 800-335-3300). The Baglioni is a stylish luxury hotel with Italian touches. 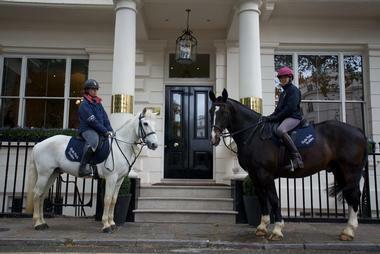 Located in Kensington, the hotel is near the city's gardens, the Royal Albert Hall and shopping. During the warm months, the surrounding royal parks are a great place for a family picnic. Luxury service at the hotel includes a 24-hour concierge, complimentary selection of music and movies, internet access and a personal butler service on request. After a day of sightseeing and shopping, visit the Caroli Spa and enjoy one of the pampering body treatments to relax and unwind. Bringing Italian cuisine with an avant-gardist twist to London, Chef Moreno Cedroni's new restaurant right on the famous Hyde Park. Menu highlights by Chef Moreno Cedroni include way fish, pasta, traditional and creative dishes, such as tempura of scallops in black squid ink, clams and courgettes. Combine a weekend escape in one of the hotel's stylish rooms with dining at this hot new restaurant. Choose from 68 rooms and 50 luxury suites with views of Kensington Palace and Gardens. Rooms start at GBP 210 per night (+44-20-7368-5700). 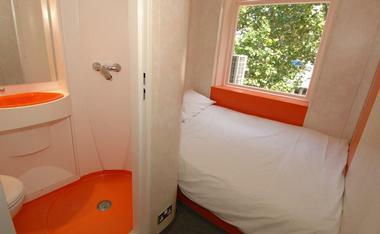 The creators of easyJet, Europe's low-cost airline, built an inexpensive hotel in the heart of London. With rates starting at GBP 20 a night, the hotel is a welcome option for those planning a cheap family getaway. The Natural History Museum is just around the corner, while stylish shops and boutiques of High Street Kensington are a short walk away. The hotel has 29 Standard Rooms without a window, 3 Standard Rooms with a window and 2 Disabled Rooms. Hotel rooms can accommodate up to two people. All rooms have a private bathroom, heating and cooling. To watch the flat screen TV in the room, you will need to buy a remote control from reception (GBP 5 for 10 channels for 24 hours). Housekeeping service is an optional extra at a cost of GBP 10 per occurrence. There are numerous restaurants and pubs in the area. Room rates start at GBP 20 per night. 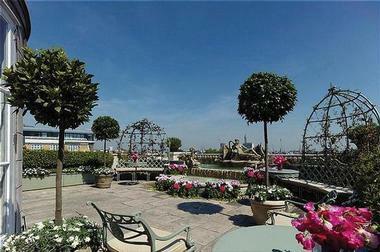 The Chelsea Harbour Hotel is a stylish 5-star, all-suite hotel overlooking the Chelsea Harbour and the river Thames. Although you will have to take a taxi to get to popular attractions, the hotel is a stylish choice for anyone looking for spacious accommodations with scenic views. There are 160 suites on eight floors. Each suite comes complete with a sitting room, bedroom and a spacious marble bathroom with a separate bath and shower. There are six penthouse suites with magnificent views of the harbor and the river. After a day out exploring the city, cool off in the 17 meter pool. There is also a fully equipped gym, sauna, steam room, massage and beauty rooms if you want to work out. Aquasia Restaurant, serving Mediterranean and Asian cuisine, offers scenic views and al-fresco dining on warm summer days. Room rates start at £ 137 plus tax per night. The Victoria & Albert Museum and Natural History Museums are 10 minutes by taxi from the hotel. Buckingham Palace, Hyde Park, Big Ben and Knightsbridge are 20 minutes by taxi. No.11 Cadogan Gardens is a private townhouse hotel located in a quiet tree lined square, near the Harrods department store and the Sloane Square tube station. The sixty rooms at the hotel are decorated in fabric from Colefax & Fowler, the furniture is traditional and the beds are made up with crisp white Egyptian cotton sheets. Many of the bathrooms are marble with extra deep bathtubs and soaps and conditioners from the White Company. The dining room serves breakfast, lunch and dinner. Victoria Station, which provides train service to/from Gatwick Airport, is just 5 minutes away by taxi. Paddington Station and the Heathrow Express is 15 minutes by taxi. Number Eleven can provide a chauffeured Mercedes for Airport and Eurostar connections. Rates range from GBP 155 to GBP 525 (+44-207-7307000). Centrally located in Knightsbridge overlooking Hyde Park, Lanesborough Hotel London offers travelers classic Regency interiors, exclusive butler service and a relaxing Spa Studio. There are 93 luxury guest rooms and suites decorated with furniture from the Regency Period and art from the 1820s. When you check into this stylish hotel you will have a sense of stepping back in time. 21st century state-of-the-art technology is concealed within the rooms, giving you access to the latest technology while preserving the historic feel of the rooms and suites. If you need more space on your family vacation , ask for one of the romantic specialty suites, such as the Apsley Suite, Buckingham Suite, the Royal Suite or the Lanesborough Suite. Choose from a variety of luxury services and amenities. The 24 hour Butler Service, offered in all room categories, includes unpacking, packing and assistance with every guest needs. Complimentary amenities include an interactive TV system with Movies on demand, Digital Music library with extensive play list, bowl of fresh fruit, assorted sweets and mineral water replenished daily, and iPod Docking stations available on request. Spa Studio offers a choice of relaxing treatments that utilize La Prairie and Ytsara products. The Fitness Studio, located on the ground floor is open 24 hours a day and open exclusively to the guests. Room rates start at 495 GBP per night. 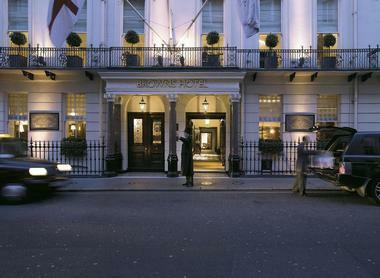 The Dorchester hotel is centrally located on Park Lane in London's Mayfair District overlooking Hyde Park. This luxury getaway is a classic Old World hotel which has attracted famous and notable guests since its opening in 1931. When you visit for the first time, the hotel begins recording your personal preferences and needs which are then automatically taken care of when you return. With three staff to each guest room ratio, the hotel provides the ultimate in luxury personalized, attentive service. The Spa features a fitness center, steam and sauna rooms, and whirlpool baths. The spa is a place to relax and enjoy a massage on your luxury vacation. Hotel rooms and suites are all luxurious and unique in design. Bathrooms feature Italian marble and large deep tubs. There are four restaurants which serve Chinese, British and Italian cuisine. The Promenade, the lavishly decorated lobby of the hotel, serves the traditional English afternoon tea. 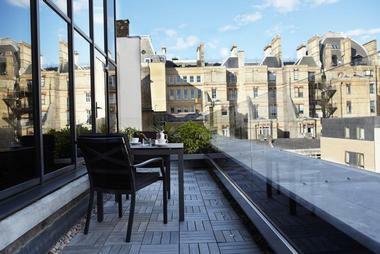 >The property is located near London's fashionable shops, attractions and the theater district. Bond Street and Oxford Street are within walking distance. 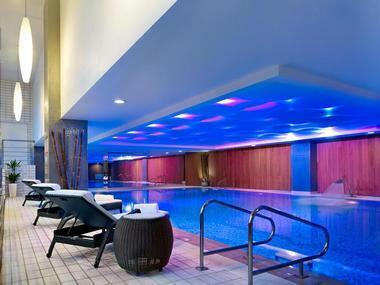 The hotel is approximately one hour by taxi from Heathrow Airport and about 1.5 hours from Gatwick. Double rooms start at £265 per night. 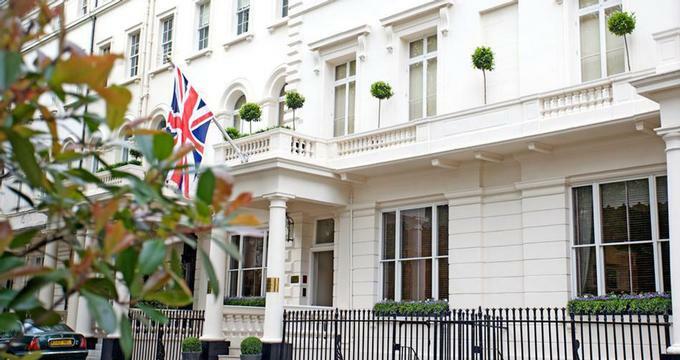 This contemporary hotel is located in a quiet street close to Hyde Park Corner, Knightsbridge in London. Each floor was designed to reflect a different element - water, air, fire and earth through the use of colored slate. There are 41 guest accommodations. After a day of sightseeing, take a bath in the deep tub. For added luxury, request one of the 5th floor suites. You will be able to adjust room lighting, temperature, turn on the do no disturb sign, request room service or call the butler using the consoles at the side of the bed. There is 24-hour room service, perfect for kids who are always hungry, complimentary mobile phone rentals and a 24-hour concierge. Sip drinks at the elegant lobby bar and dine at the gourmet restaurant. Doubles start from 305 GBP, suites from 475 GBP (+44-(0)20-7333-1000). Brown's Hotel is a luxury getaway which has recently completed a 24 million GBP restoration. Featuring contemporary interiors, the hotel is located in the heart of Mayfair on Albemarle Street. Guests have easy access to Bond Street shopping, West End theaters, major attractions and St James's. The hotel is composed of 11 Georgian town houses and offers 117 guest rooms (including 29 luxurious suites). The spa offers a wide range of treatments for ladies, gentlemen and children. You can ask for a customized treatment based on your personal preferences and health considerations. HIX Mayfair serves British classics using local seasonal ingredients. The English Tea Room serves traditional English afternoon tea and light snack The Donovan Bar serves cocktails, wines and Champagnes accompanied by Live Jazz on most days of the week. Rooms start from GBP 320 per night. London is one of the world's great cultural cities. It offers many museums, galleries, theaters and attractions. It is also home to internationally renowned concert halls such as the Royal Opera House, Royal Festival Hall and Royal Albert Hall. The weather can be quite unpredictable and you should be ready for both sun and rain, especially in spring and fall. Average winter temperatures are around 42 degrees Fahrenheit and summer temperatures are in the 70s. Summer is a great time to visit London and there are many activities to choose from. Famous musicals, theater, shopping, new spas and timeless attractions await the visitor to this European city. Here are some of the top attractions to visit with kids. In August and September when the Buckingham Palace is open to the public, visitors can tour the State Rooms, including the Throne Room, Picture Gallery and State Dining Room. Approximate visit time is 2.5 hours. In August and September, guided tours are available at the Houses of Parliament. Visitors can see The Queen's Robing Room, The Royal Gallery, The Prince's Chamber, the Chamber of the House of Lord's, the Central Lobby, House of Commons, Members Lobby, Division Lobby, St Stephens Hall and Westminster Hall. Tower of London houses the priceless Crown Jewels. You can also see Traitors' Gate, the Medieval Palace, the Bloody Tower and the famous ravens. This is one of the newest London attractions. Walk 140 feet above the Thames and see an exhibition which explains the history of Tower Bridge. The British Museum features collections of over 6 million objects, including mummies, antiquities and drawings. The British Museum is the oldest public museum in the world. The newest Great Court is a covered inner courtyard with a glass and steel roof. Westminster Abbey is a Gothic building which has been the setting for every Coronation since 1066. Visitors can see the coronation chair, royal tombs and the grave of the unknown warrior. This famous cathedral was designed by Sir Christopher Wren and completed in 1710. Guided tours of the cathedral lasting one and a half hours are available several times a day. The crypt houses tombs of famous figures, including Lord Nelson. A fun place to visit for kids and grown-ups alike, the Natural History Museum contains interactive exhibits such as the Earthquake area and the Dinosaurs. Plan to spend a full day since there are hundreds of exhibits to choose from. Exhibits include the history of science, technology, and medicine as well as hands-on modern technology. Display items include the Charles Babbage’s calculating machine, Apollo and a plane simulator for kids. The Exhibition includes the story of the re-creation of Shakespeare's Globe Theatre from 400 years ago. Learn about the costume and clothing design, special effects and music. Guided tours last about 1.5 hours. The museum includes collections dating back to 3000 BC, furniture, textiles, paintings, ceramics, sculpture, jewellery, books, prints and photographs. London Eye is the world's highest observation wheel (135 metres high). It provides a 30-minute, slow-moving tour of London with great panoramic views. The collection features wax figures of famous people and themed settings. At 9'-0" diameter, 7'-6" high, and weighing more than 30,000 pounds, the bell of the Great Clock of Westminster or 'Big Ben' is one of the most famous bells in the world. However, the worldwide fame of this attractions is often incorrectly bestowed, not on the bell, but instead on the clock tower in which it hangs. Today, it is impossible not to go on any bus or walking tour of London without hearing one of the groups members point and shout, "look over there in the sky it's Big Ben." When what they mean to say is, "look over there it's the clock tower." Big Ben is the name of the main bell in the clock tower, not the name of the actual tower. In 1844, the British Parliament decided that the new buildings for the Houses of Parliament, then under construction, should have a tower with a clock. After much time was spent on the planning stages, the famous bell was finally cast at the Whitechapel Bell Foundry. Big Ben was then transported from the foundry to the Houses of Parliament by a horse drawn carriage, much to the delight of the crowds of onlookers. On May 31 st, 1859, the ringing of the bells in the Great Clock of Westminster were heard across London. On this day, members of Parliament called a special meeting to decide upon a name for the new bell. After a long debate, the bell was named after the first commissioner of works, Sir Benjamin Hall. Shortly after it was put into place, the bell developed a crack that still exists today. Due mostly to increased city noise, Big Ben is not as easy to hear today as it was in 1844 but it still rings on time. The clock tower is particularly splendid now after an extensive renovation and cleaning. It is a must see stop for any visitors to London. The Phantom of the Opera has been playing since 1986 and continues to draw crowds. Remember to book tickets at www.londontheatre.co.uk before you go. The Lord Of The Rings play at the Theatre Royal Drury Lane (tickets from £15) is a spectacle for J.R.R. Tolkien fans. Over 70 actors, singers and musicians, combined with clever staging and design take you to Middle-earth during this fun performance. es Miserables at the Queens Theatre is another popular musical with over 7,500 performances in 18 years. London Bicycle Tour Company offers a great way to explore the city by bike, whether you want to join a tour or rent a bike. >Get a bird's eye view from the London Eye. You can see the Tower Bridge, Big Ben and the Houses of Parliament on your 30-minute journey through the air. Tickets include an interactive guide and a 4D movie experience. Tickets are about US $30. The Flexi Fast Track pass gives you priority boarding and costs extra - you can buy it online to avoid waiting in line. You can even rent a private capsule for a romantic proposal, a wedding or a special occasion. Madame Tussauds museum offers fun interactive exhibits such as Einstein's IQ test. p>The Berkeley features a new Pret-a-Portea cake collection served in the Caramel from 2-6pm every day (from £34 per person). There are many convenient ways to travel around - the Underground, black cabs, buses and rail. If you are planning to use the Underground, there are many passes that you can buy - from one-day to weekly travel passes. Family passes and weekend passes also exist. The city is well connected with major international cities. There are many direct daily flights from North America, which land at Heathrow or Gatwick Airport. Heathrow Airport is located on the edge of west London. The quickest way into central part of town from Heathrow is by rail (Heathrow Express). Trains leave Heathrow Airport from approximately 5 a.m. to 23:30 p.m. The train trip to the center of London takes from 15 to 20 minutes. Standard fares cost are GBP 12 one way. You can reserve online and get a reduced fare at www.heathrowexpress.co.uk. Alternatively, you can take the London Underground (The Piccadilly line) which take about 50 minutes and costs GBP 3.60. Black cabs are also readily available at the airport. Gatwick Airport is situated 28 miles south of London. The quickest way into central London from Gatwick is by rail via Gatwick Express. Trains leave Gatwick Airport from 4:35 a.m. to 1:35 a.m. and run every 15 minutes at peak times. The train ride to Victoria station lasts about 30 minutes and costs GBP 11 one way. You can book your tickets online at www.gatwickexpress.co.uk. Black cabs are also readily available at the airport. If you are planning to tour many attractions, you can purchase the London Pass which gives you unlimited access to more than GBP 200 worth of attractions and free travel in London. Great British Heritage Pass gives unlimited access to over 600 properties throughout the UK. It can be purchased by overseas visitors from British Tourist Authority offices. The London for Less card offers reductions at over 200 places in Central London, including money off theatre, concerts, opera and ballet tickets. It is available from bookshops and the Britain Visitor Center in Regent Street. Get a bird's eye view of the city from the London Eye. Get the free interactive app for iPhone, iPod touch and iPad created by the Museum of London. Streetmuseum works by connecting the present day street scene to hundreds of historic images of the city. In addition to viewing old photos of the location that you are touring, you can also read about the history of each site. Download the app before your flight and get to know the city before you land which will make it easier to get around and plan your activities. You can play a game with kids to keep them entertained during the flight. Look up the area surrounding the hotel and point out familiar landmarks. Once you land, you can continue the game and use the app to explore the city hands-on. From room discounts and free nights to great spa and family packages, hotels in London offer travelers a great way to vacation in this incredible city for less. Try the Harry Potter package and take a tour that lets you take a peak at how the famous movies were made, go see the new Charlie and The Chocolate Factory Musical, or get away with a relaxing luxury spa package. There is plenty to choose from. Check into One Aldwych with your family and enjoy a free stay for your kids. Book a spacious two bedroom suite and receive the children's bedroom free of charge. Breakfast will be complimentary throughout your stay with options that range from traditional full English breakfast to decadent chocolate chip pancakes. Enjoy lower rates and special perks at the Dorchester spa with the "Spa and Stay" special which includes: 1 hour aromatherapy massage each at The Dorchester Spa, An exclusive gift from spa, Two glasses of champagne and English breakfast for two. Rates start at 714 GBP including tax. The Athenaeum is offering a Harry Potter special from 370 GBP which includes: Tickets for the to the Warner Bros Studio Tour - The Making of Harry Potter, Accommodation for one night, Full English breakfast for 2 people, Free dining for Kids 12 and under, VAT at 20%, Complimentary drinks and snacks from the mini-bar, Free Wi-Fi and Full use of the hotel spa, gym and hot-tubs. Syon Park is offering three nights for the price of two, a 33% savings. Moreover, a second room for children aged 18 or younger is charged at 50% of the rate of the first room. Dukes hotel is offering Nigel Mendham's Children's Chocolate Afternoon Tea Factory which includes home-made chocolate treats followed by the new Charlie and The Chocolate Factory Musical at the Royal Drury Lane theatre. It includes: Shortbread decorated as The Golden Ticket, Blueberry infused pudding (Bubble gum addict Violet Beauregarde turns into a giant human blueberry after chewing on Willy Wonka's magical bubblegum), Gingerbread men resembling Oompa-Loompas, and Oozing chocolate fondant with eclair surfboards (holding an oompa loompa) in tribute to Willy Wonka's flowing chocolate river. 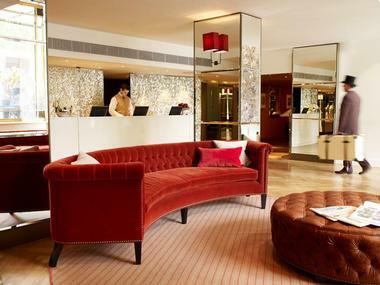 The Halkin Hotel is offering 15% off suites when you book at least 7 days in advance. Starting at 575 GBP, Mandarin Oriental Hyde Park the "Urban Spa Escape" includes: Full English Breakfast for two (including healthy options) and a Choice of 2 x 50 minute Oriental Essence or a 1 hour and 50 minutes Treatment Experience per room. The "Sightseeing Special" at The Royal Park Hotel starts at 435 GBP and includes: One day's free fast track entry for two people to 55 different London attractions, as well as a host of special offers and discounts. The special also includes a welcoming drink upon arrival followed by a Devonshire afternoon cream tea for two as well as a glass of champagne and canapes every evening of your stay. The Ritz Hotel London is offering the "Happy Families" special which includes: A Welcome Gift upon arrival, Souvenir Membership Card, Access to the Teen Concierge, Unlimited complimentary ice-cream, An evening treat upon turndown, Wii or Playstation game consoles in-room, Selection of age-appropriate children's books and DVDs in-room, Children’s-sized bathrobes and slippers, Special children's bathroom amenities, Special children's room service menu, and Complimentary children's breakfast. The Corinthia Hotel is offering the "Suite Treats" special with rates from 415 GBP which includes: a Choice of luxury accommodation in one of London's top suites, In room check in, Unpacking service, English Breakfast, Champagne, spa access, late check-out. No.11 Cadogan Gardens is offering a weekend package. Stay between Friday and Monday for a minimum of two nights for a 15% off of the best available room rate, with a continental breakfast included each morning. The Berkeley Hotel is offering a gourmet special which includes Chef's Menu at Marcus Wareing at the Berkeley plus an overnight stay from just £720 (inclusive of taxes) based on two guests sharing a Deluxe King-bedded room. You will be welcomed with a bottle of champagne in your room as well as a signed cookbook and chocolates from Marcus Wareing. The evening will then continue into his two Michelin-starred claret-hued dining room and your overnight experience will be completed the following morning with an English breakfast.